The 3DS Virtual Console is only getting its titles revealed every week, but the Wii Virtual Console is still sticking with the tried and true method of revealing the entire next month's plans at the end of the previous month. There's not really any big surprises this time, though there is one small one in the form of G-mode finally bringing a certain classic Data East franchise to Virtual Console, possibly in anticipation of an upcoming WiiWare game. 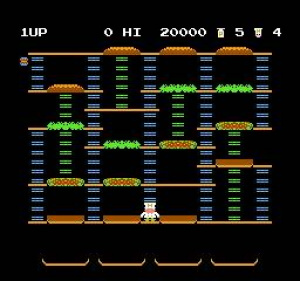 Binary Land — An interesting Hudson title, in which each stage is split in two halves: you control a penguin on both sides, which you both control at the same time. Obviously, the trick is to figure out a way to make both of them reach the exit simultaneously. BurgerTime — No doubt to prepare for the WiiWare game, in this arcade classic you control Peter Pepper as he runs across gigantic slices of meat, salad and buns in order to create hamburgers, while avoiding the live food out to get you. Ninja Master's — Another fighting game featuring a variety of ninja characters. The main gimmick here is that characters can switch between hand-to-hand combat and using a weapon at any time during a battle. And yes, the title really has that apostrophe in it. League Bowling — A fairly standard bowling game, though it does have a nice cartoony presentation. 3DS Virtual Console downloads continue to be revealed every week instead of every month, but in case you missed it, last Wednesday, Japan's 3DS VC games were Double Dragon and Game & Watch Gallery. Clearly Nintendo is running out of games to put up for Wii's Virtual Console. Sad to say we may not get games like Yoshi's Island or Starfox, unless they are saving those for Wii U or something. Say, come to think of it, has Nintendo even mentioned Virtual Console being available on the new system yet? @2 Bro, it's not even the arcade version. Game & Watch Gallery?! Lucky! I hope League Bowling, Burger Time and Game & Watch Gallery come to North America! Nice burger time update. I didn't think we'd be getting the original, just the WiiWare. 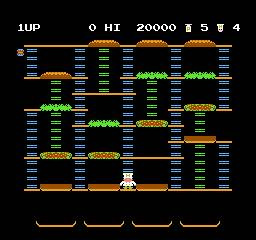 I'd rather have Binary Land, but I seriously doubt it will happen because it's too obscure of an import. I've tried to play Burger Time, but just found it more frustrating than fun. Meh, nothing really interests me. Looking forward to downloading G&W Gallery. Is Binary Land the same thing as Devil's World? I've played both the arcade and that, but I think I spent more time with the NES version... I guess there's hope after all of it coming. That combined with the WiiWare version would be GREAT. As for Ninja Master's... is that the 3rd in the series of Ninja Combat and Ninja Commando? Me and a friend played those mostly out of love for multiplayer arcade games and the cheesiness of their stories and characters. I need both of these games over asap! I have G&W Gallery 1 and 3. I rented 2 one time and I really like that one the most. 3 was great and the music in the "Greenhouse" game is amazing.. It needs to be orchestrated! Yeah, I kinda obsessed over the soundtrack of these games. I wouldn't hold my breath for Burger time HD on wiiware. Developers hate it to put HD games on the wii, since they have to remove the HD. And they hate it even more to bring a HD game to wiiware! In fact, it's a miracle that Rayman origins will come to the wii. If it still was bound to be a episodic game, we most definitely could write it off. I also have a feeling we can forget about Retro-city rampage, though that's just me! @Henmii, the game is no longer called BurgerTime HD and I'm sure MonkeyPaw will follow through with the WiiWare version. @Rapadash6: They still release good classics like Burger Time and expensive and rare Neo Geo games. I say they're just fine, and the service will continue as long as there are good retro games. By the pace of quantity, surprises, and good games being released on VC and WW I guess this service will be exciting for a long time. It's just that realeses drop in very slow lately, and I would prefer at least 1 VC game + 1 WW game + 1 WW demo a week. It looks as if most developers already work on WiiUWare and Nintendo is saving some of the best VC games for Wii U VC launch too. Would the Wii U controller be a good idea for SNES games like Mario Paint? Or Yoshi's Safari, Mario & Wario, NES Zapper games? Will they release Starfox, Yoshi's Island, Earthbound, Terranigma, Stunt Race FX, in the first weeks just to generate fanservice sales? Or will the Wii U service continue being as sparse as the Wii Shop releases? @Pastry4prez: No, Binary Land is a puzzler by Hudson Soft, and Devil World is an arcade game by Nintendo. @MeloMan: Ninja Combat, Ninja Commando, and Ninja Master's were all made by Alpha Denshi, so there might be a connection between those titles. Unfortunately I haven't played any of them yet. No Yoshi's Island! at the moment I'm watching the Simpsons at the time of writing this and as Homer says D'oh!! and thats what I say. Binary Land is a game where you control one penguin, and the second one automatically moves in a mirrored direction. So, it's a puzzle to navigate them both through the maze to meet each other at the goal. Ninja Master's was an awesome game, it may not be the best Neo Geo fighters like Samurai Shodown and Last Blade but at least it's a well balanced fighting game. I was excited for Burger Time, but not the Famicom version. I'm holding out for the arcade. When are we getting Devil World? @MeloMan Ninja Masters has no other connection to Combat & Commando other than the same company and having "Ninja" in their names. Why can't We have League Bowling? Everybody else is getting the good games and not us. I wish the US had announcements like this so we only have to suffer once and not four times a week. Glad to see others still want Devil World like me. Talk about a good choice for probably one of the last NG VC games. Been waiting for years now but sorry to say it doesn't look like Gods, The Chaos Engine or even Quackshot will make it now. What a shame! Quackshot is a licensed game so clearly it wasn't going to be added. I WANT EARTHBOUND ON THE VIRTUAL CONSOLE! Any information about this one? I really want to play it ! "the game is no longer called BurgerTime HD"
Yeah, it has came to my attention! Still haven't release Contra, Mega Man 6, Battletoads, TMNT II & III, and many more good games (and those are just NES titles). They could do more if they really wanted too, but they're phoning it in for the remainder of Wii's lifespan. And why would you want VC on the Wii U? You just paid for these games during the Wii's run, why would you want to pay for the exact same game on the next system?